When you try to install VMware ESXi on some whitebox hardware that is not officially supported by VMware then your attempt might come to an unpleasant end after the installer presented the error message shown above. ESXi has in-box support for a limited number of network interface cards (NICs), and sadly a lot of consumer grade devices are not on the list. Is this the end of the world? No. If you are a regular reader of my blog then you probably already know that help (and in some cases even rescue) is available. However, I keep getting e-mails from people asking how to get their NIC xyz to work with ESXi ... So I finally took the time to write down all the steps that you need to take and the options you have - just to point them here instead of giving the same answers per e-mail again and again. If you have a recent VMware vSphere installation with a vCenter server in production or in a lab then you will be aware of that the Web Client is the recommended choice for managing the environment and that the well known C# based vSphere Client is considered deprecated or legacy (since version 5.1 already). However, when you connect to the Web Client of your freshly installed vCenter server for the first time using your favorite Internet browser you will be greeted by a more or less alarming warning. 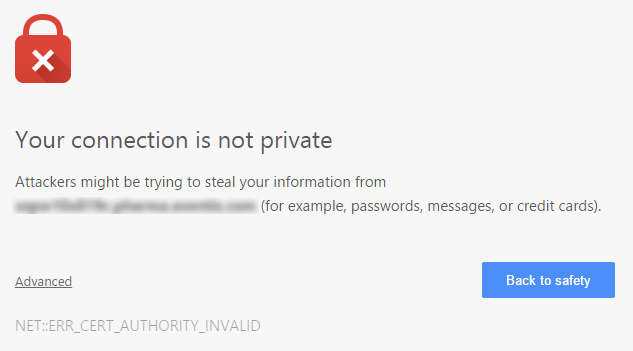 Chrome even warns you that VMware might steal your credit card information ;-) (well, they probably already have that) ... You should really be worried whenever you see this warning on a random Internet site, but you don't need to if it's your company internal vCenter server that you try to access. So, why do you get this message, and how can you get rid of it? The October 2014 patch of ESXi 5.5 already got a lot of attention, because it introduced additional Transparent Page Sharing (TPS) management capabilities to prepare for TPS being disabled by default in upcoming ESXi releases. And William Lam pointed out that this patch enables support for the Apple Mac Pro 6,1 ... but there is even more goodness in this patch! When adding the associated Image Profiles to the VibMatrix I noticed that this bundle includes a new package named xhci-xhci. The related KB2087362 article only includes the standard disclaimer, but no information about what this really means: xHCI stands for Extensible Host Controller Interface, a USB standard that supports USB 3.0 (or SuperSpeed) controllers and devices. That means with the latest ESXi 5.5 patch you are - for the first time - able to utilize USB Passthrough with USB 3.0 devices! I have just released version 2.3 of my ESXi-Customizer-PS script - a PowerCLI script to create customized ESXi installation images and the destined successor of my ESXi-Customizer tool. I was somewhat in a hurry to get this out, because with the release of ESXi 5.5 Update 2 a bug in PowerCLI ImageBuilder manifested itself that needed a workaround. The new version implements this workaround, but also has one other improvement that you will like. 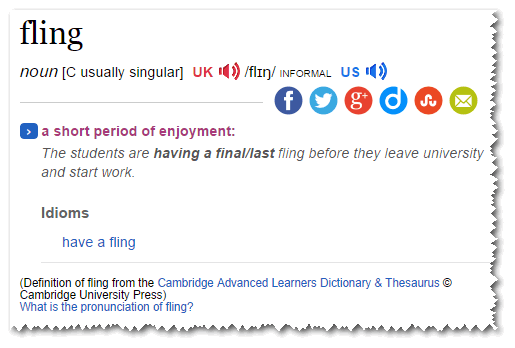 When you heard about VMware flings for the first time (if ever) you probably wondered what this is: Flings are short-term projects that VMware engineers work on - supposedly in their spare time, just for fun -, and they result in software that is not officially supported by VMware, but serve a specific purpose and address challenges that you might have when using VMware products - in a very handy way. They are published by VMware Labs that also do some very interesting academic research and publications. It looks like yesterday the whole IT Community was pretty much focused on the much anticipated Apple Live event, so you might have missed an important VMware announcement: vSphere 5.5 Update 2 was released. Besides the usual bug fixes there was one important new functionality added that will make a lot of VMware Admins happy, especially those who do not like the new Web Client. With all the ongoing VMworld buzz there is at least one news over at William Lam's VirtuallyGhetto blog that did not get the attention that it deserves: VMware has released a new fling for ESXi that implements a MAC learning network filter. That is an important one and highly recommended for all the folks that use nested virtualization on top of ESXi. 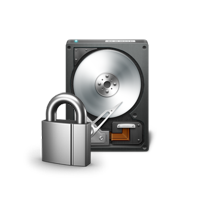 Do you need disk encryption for hosted VMs? Nowadays disk encryption is a common practice with mobile personal devices, because it prevents unauthorized access to sensitive data when such a device is lost or stolen. I was also aware of the virtual machine encryption capabilities that are built into the VMware Personal Desktop products (Workstation and Fusion) although I never used them ..., but - until recently - I never thought about encrypting a VM that runs on a hosted hypervisor in a data center. 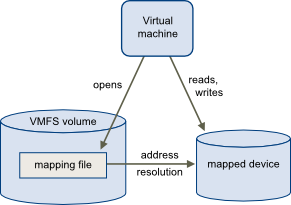 I'm currently supporting a large VMware Storage migration project affecting MS Exchange 2010 server VMs that use lots of Raw Device Mappings (RDM) for mailbox storage. This was a good opportunity to further improve my Powershell / PowerCLI skills - I wrote some scripts to gather the data needed in a friendly format, and I thought it would be a good idea to share them here. In their recently released KB2073791 article VMware describes an issue that affects ESXi 5.x installations on hosts with an Intel E5 v2 series processor: VMs running Windows 2008 R2 or Solaris 10 (64bit) experience random blue screens resp. kernel crashes. The root cause is a known bug in the CPU microcode of the mentioned processors. It leads to incorrect memory page translations when the EPT (Extended Page Tables) feature of the CPU is enabled and is mentioned as Erratum CA135 in an Intel specification update of the E5 v2 CPU family. EPT is an important CPU virtualization feature and helps to offload the VM memory address translation to the CPU which can significantly increase a VM's performance. So this bug is rather critical! How can it be fixed? 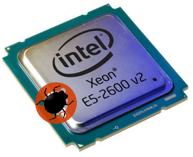 New ESXi 5.5 patch fixes NFS bug and another serious OpenSSL bug! Yesterday VMware finally released a fix for the nasty NFS bug that was introduced with ESXi 5.5 Update 1. 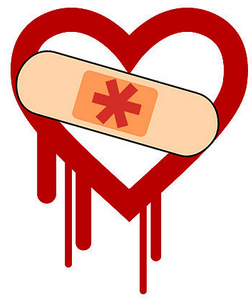 Customers who were waiting to update to U1 because of this bug can now safely update their hosts and will also get protection from the OpenSSL Heartbleed bug. But there is another reason why you should update your ESXi 5.5 hosts with this patch very soon - even if you are not affected by the NFS bug and have already applied the Heartbleed fix! 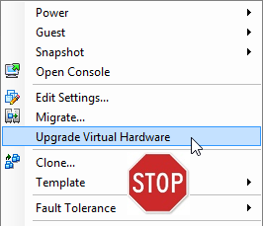 Lately I was troubleshooting a PSOD issue on one of our ESXi 5.0 hosts with VMware Support, and they advised me to downgrade the bnx2 driver to the ESXi builtin version (I had a newer HP supplied version installed because it was HP hardware). Later it turned out that this was a wrong advice, but at that time I wondered: How do you do this? I am excited to welcome Opvizor as a new sponsor to my blog! This fairly young startup offers a unique approach to keep your vSphere environment healthy. It is not about real-time monitoring (there are already plenty of products that do this), but Opvizor analyzes your environment for compliance with best practices, and it knows about and detects lots of common issues, misconfigurations and mistakes. Its goal is to prevent issues before they happen. While browsing through the VMware Community Forums I stumbled over a thread that made me curious: A customer experienced serious issues after upgrading his vSphere environment to 5.5 Update 1. The ESXi hosts became unresponsive right after the Software iSCSI adapter was added. Update 1 for vCenter Server 5.5 was recently released, and the Windows version now officially supports being installed on Windows Server 2012 R2. So far I had the 5.5 GA version running on a Windows Server 2012, and after installing the Update 1 (which went pretty smoothly) I thought that it's a good idea to now also upgrade the OS to 2012 R2. 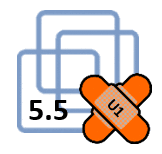 We recently upgraded a vSphere 5.0 environment to 5.0 U3 and used the maintenance window of the vCenter server to also install missing Windows updates on this and the vCenter database SQL server (both running Windows 2008 R2). Since a long time VMware supports device hot plug in its Virtual Machines. This leads to the "Safely Remove Hardware and Eject Media" tray icon to be displayed in Windows VMs, and it allows a user to eject the network card and even hard disks from the machine. While the latter will fail in most cases, because the hard disk is in use by Windows, ejecting the NIC will succeed ... and it will do exactly this. The NIC will disappear from the VM, which will disconnect from the network until a VMware administrator re-adds a new NIC to it! How many times were curious Windows Admins or VDI desktop users not only tempted by this possibility, but even used it - only to find themselves disconnected from their machines with no way to re-connect ;-) ?! The first few times this may be funny, but then you will want to look for ways to prevent this. Google is you friend, and you will easily find many different ways to address this issue, but scattered across even more blogs and sites. This is my attempt to collect all of them in one blog post. 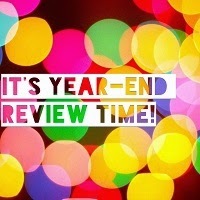 Eric Siebert over at vSphere-Land.com has kicked off this year's Top vBlog voting. This time it's bigger than ever, and Veeam is sponsoring some cool prizes to win for both voters and bloggers! You will find this blog not only in the overall favorites list, but it is also participating in the categories "Best Scripting Blog" and "Best Independent Blogger". 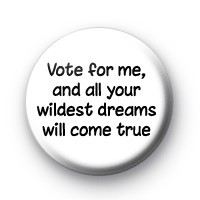 If you have found useful information, scripts or tools here at the VMware Front Experience Blog or/and are a regular reader then please show your support by voting for me. Head over to vSphere-Land.com to cast your vote - Thanks!! I have released version 2.2 of my PowerCLI ImageBuilder based ESXi customization script ESXi-Customizer-PS! This version integrates Online Depots as a source for customization packages. Here are the changes in detail and some examples of how to make use of them. It is a good practice to update VMware Tools on your VMs after you have updated your vSphere environment to a new major or minor release. VMware tries to make this very easy by providing means to automate the VMware Tools installation/update (through the vSphere legacy and Web Client, and PowerCLI), but in a lot of environments there is a requirement to take complete control over software provisioning on Windows servers and/or the need to customize the VMware Tools installation and remove unwanted features that are installed by default. For this purpose you will want to take a careful look at the VMware Tools MSI package. I did this with the latest Tools version of vSphere 5.5, and here are my findings. 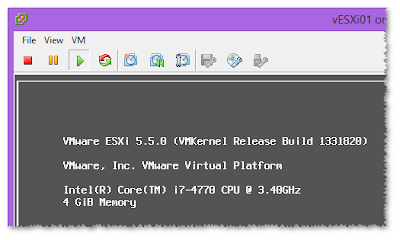 After upgrading your ESXi hosts to 5.5 the "Upgrade Virtual Hardware" function of the legacy vSphere Client will update the virtual hardware of a VM to version 10, although the legacy client is not able to edit the properties of version 10 VMs (see my earlier post about How to update to ESXi 5.5 ...). Only the Web Client is able to do this with version 10 VMs, and that requires vCenter. If you do not have vCenter available or do not feel comfortable with the Web Client for other reasons then you want to avoid upgrading virtual hardware to version 10. But how can you upgrade to only version 9? 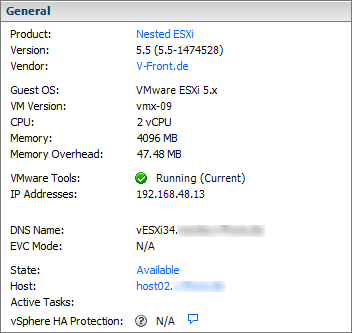 In my last post I presented a walk-through about how to create a nested ESXi host and make an OVF template of it. After deploying this template a manual step remained: Configuring a hostname and the IP address configuration. If you deploy a virtual appliance that was produced by VMware (e.g. the vCenter Log Insight appliance) then you are often presented with the choice to configure the networking of the VM in the OVF deployment wizard. How is this done, and can we use the same method to customize the nested ESXi vApp? Yes, we can - and here is how. Nested ESXi hosts (that means ESXi running inside a VM) are a very cool method to test and evaluate even complex vSphere scenarios on a single physical box. There are a lot of guides already available for installing a nested ESXi host, but most of them assume that you have a paid ESXi license or even vCenter available to manage it. ... you are limited to virtual hardware version 9 and must not use version 10. And - that's most annoying - you also cannot use PowerCLI to create or configure VMs (because the relevant APIs are restricted with the free license)! While testing direct host access to the new V-Front Online Depot (via esxcli) I stumbled over an annoying issue that I was finally able to resolve, but it was hard to find the root cause ... So I want to share my findings here in the hope to make life easier for all the others that will - very likely - stumble over the same issue. If you experience the issue then these commands will work as expected, but they will take a very very long time (>10 minutes!) to execute and return. Of course there are other and more obvious root causes for slow network access: a slow or saturated up-link to the Internet, improper NIC speed negotiation settings etc. The included mkisofs tool (that is used to build the customized ISO file) was replaced by a newer version that does no longer produce ISO files with corrupt headers when used with the UEFI boot option. In earlier versions I made the UEFI boot optional (and disabled by default), because it would create invalid ISO files that can not be opened by ESXi-Customizer itself or other applications. This is now fixed, and UEFI boot is no longer an option, but always enabled. Added detection of Windows 8/8.1 and Server 2012 (R2) to the Windows version check. 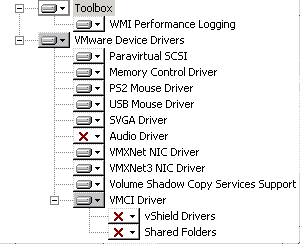 These are all supported for customizing ESXi 5.x, but not for ESXi 4.1. Added a check for the parentheses characters "(" and ")" in package file names (These would make the script fail in earlier versions). Moved the version update check script to my new site http://vibsdepot.v-front.de. This is also the new place to download ESXi-Customizer, because Google does no longer want us to provide downloads at Google Code. 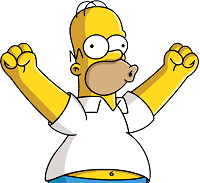 At the same time I officially declare the ESXi-Customizer tool deprecated. The new version 2.7.2 will be the final one (unless there is a really stupid bug in it that makes it useless)! So, why will I stop development on a tool that has been downloaded about 100.000 times as of today?! ?